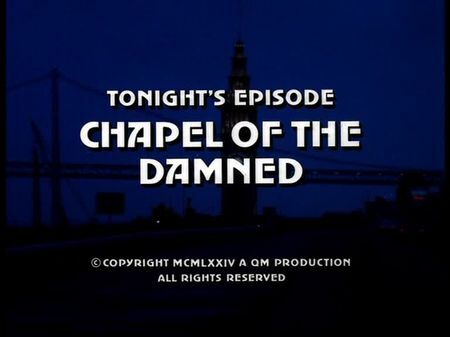 I have added the screencaps for Chapel of the Damned to the episodes' page. In this episode, Mike and Steve are confronted with a tough case and even tougher circumstances. A wealthy woman, Mrs. Adele Sloan, whose daughter is kidnapped and held for ransom, has more faith in a female psychic than in Mike's and Steve's investigation work. In the very beginning, Mrs. Sloane's prejudices and early evidence are pointing at the daughter's boyfriend, Mark Dillon, who is everything but a perfect gentlemen and, furthermore, cannot provide an airtight alibi. Nonetheless, a broken contact lens the crime lab specialists found in the get-away car as well as a stuttering phone call by one of the kidnappers lead our two cops to a perfidious fraud and the brain behind the scene. Locations of this episode include the apartment complex where Mrs. Sloane's daughter is kidnapped and many scenes filmed right in front of the building as well as inside her aparment at 2000 Broadway. Mark Dillon is working at the National Cold Ice Storage facility located at the northern edge of Potrero Hill at Alameda & Rhode Island (now demolished), whereas his apartment is found on Waller Street in the Upper Haight district. Carlos Rubiro's hotel room was located in the 'Hotel Atlanta' at 92 7th Street, south of Market, an area that has been completely re-built over the past two decades. Mrs. Vasiliev's 'Chapel of the Mind' is at 1083 Dolores Street, and she kills her stuttering henchman in John McLaren Park. The ransom handover sequence takes place at San Francisco International Airport, in the SF Helicopters terminal building, and the final act is supposed to be SF General Hospital (according to the short exterior view at the beginning, with no acting) but, as far as I can say, it rather looks like California Pacific Medical Center's Davies Campus in Duboce Triangle (interior acting scenes with Mike, Steve and Mrs. Sloane).